Hello all and thank you for stopping by today to help celebrate the launch of December My Monthly Hero Kit from Hero Arts (more about the kit and blog hop below). 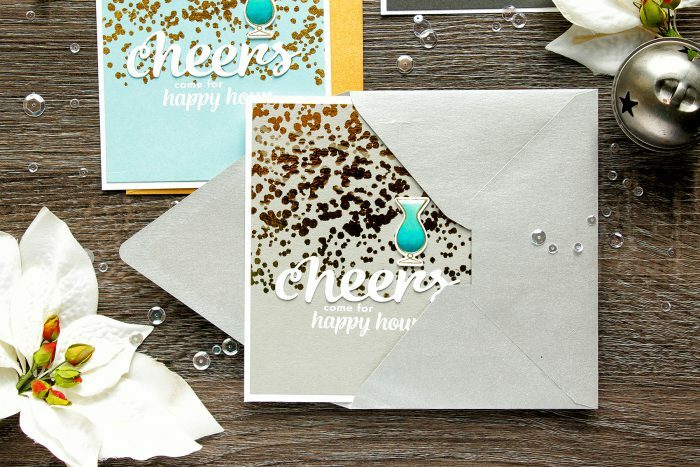 This month kit was designed to help create unique one of a kind party invitations, Birthday cards and so much more! I fell in love with the kit and thought it was perfect to create invitations for a Happy Hour Cocktail Party that a friend of mine is hosting before New Year. Like these projects? Pin them and save for later! To create these invitations I pre-cut colored cardstock into 4 1/4 by 5 1/2 ” panels (I later trimmed each panel to 4 x 5 1/4″). I used several colors of cardstock from Simon Says Stamp for these (not all colors are shown on photos) – I like how thick and durable this cardstock is and I just adore the colors. I used: Fog, Smoke, Sea Glass, Audrey Blue and Surf Blue. I wanted to create a confetti-like background, but I didn’t have a stamp for that, so instead I looked through my stash and found Color Layering Fall Tree stamp set from Hero Arts – I used 2 sets of dots and Versamark ink and stamped my own confetti background on each of my panels. If you don’t have this stamp set you can make dots using stamps from the Birthday Celebrations stamp set (its an add-on for this month kit) or look for other small dot cluster stamps in your stash. I wanted to do foiling, so I grabbed my Royal Sovereign Laminator Machine (its been a long time since I used it), silver and gold foil and foiled over my heat embossing. It didn’t turn out perfect, but I think those imperfections added a lot to the handmade look of these invitations. 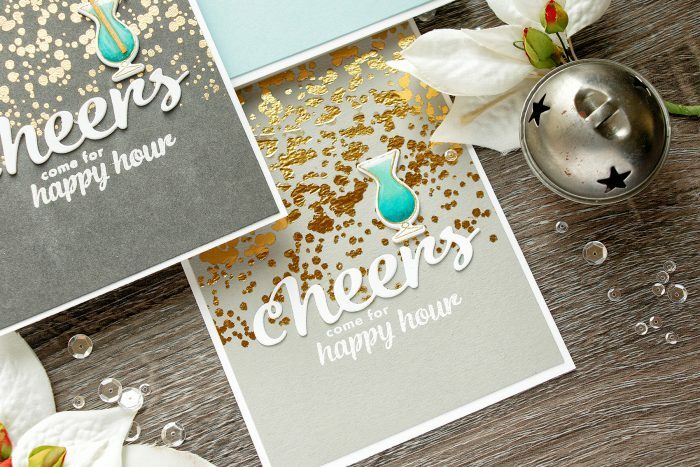 If you don’t know how to foil over heat embossing check out THIS video tutorial where I add tiny foiled accents to color layering images. I kept some of my heat embossed backgrounds as is – without foil. I loved that heat embossed look too. 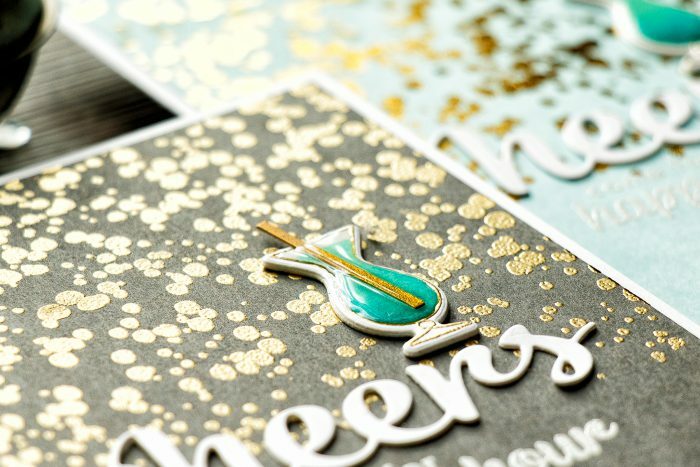 For each of my invitations I die cut word “Cheers” twice out of white cardstock. I added double sided adhesive to one side of my white cardstock before die cutting the words out to be able to adhere them easily onto my project. I went with two layers instead of one as I wanted to add a bit of dimension to my invitations, but I didn’t want to have too much of it at the same time. 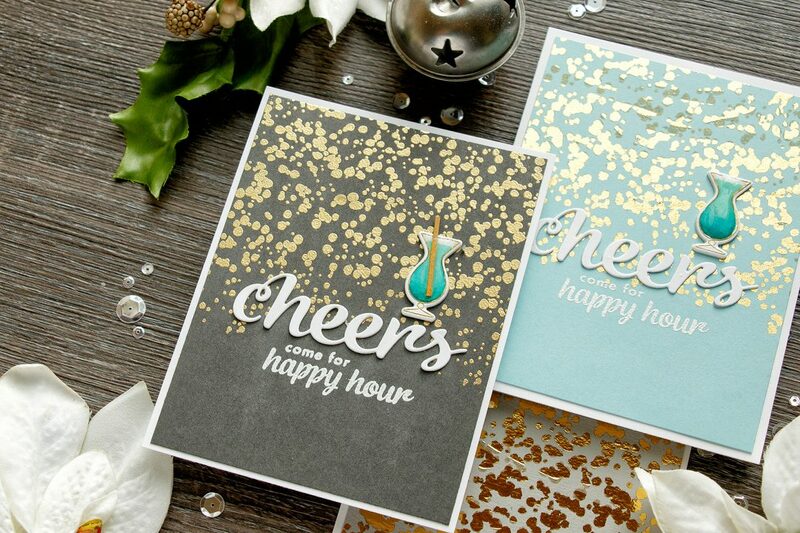 I also heat embossed Come For Happy Hour using white embossing powder. The details of the party (time, place etc) were printed onto white cardstock panels cut to 4 1/4 by 5 1/2 ” and are available on the back of the invitations. To finish my invitations and add something special I adhered a dimensional drink to each. 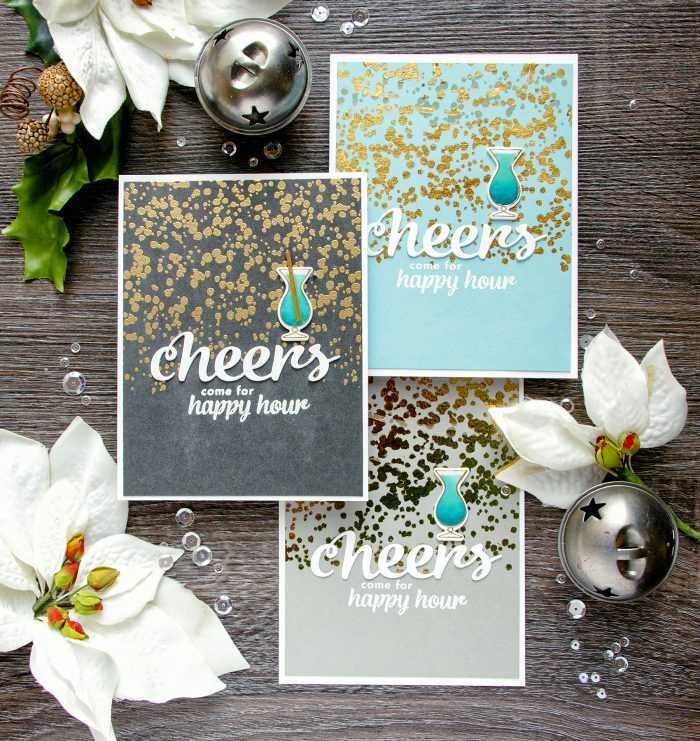 I created those by heat embossing a glass outline in gold embossing powder onto white, cutting it out using a coordinating die, coloring using Copic Markers (I used: BG18, BG15 and BG32) and coating with a thick layer of glossy accents. I added a cardstock straw to some glasses for a more realistic look (I simply trimmed gold cardstock into a narrow strip). 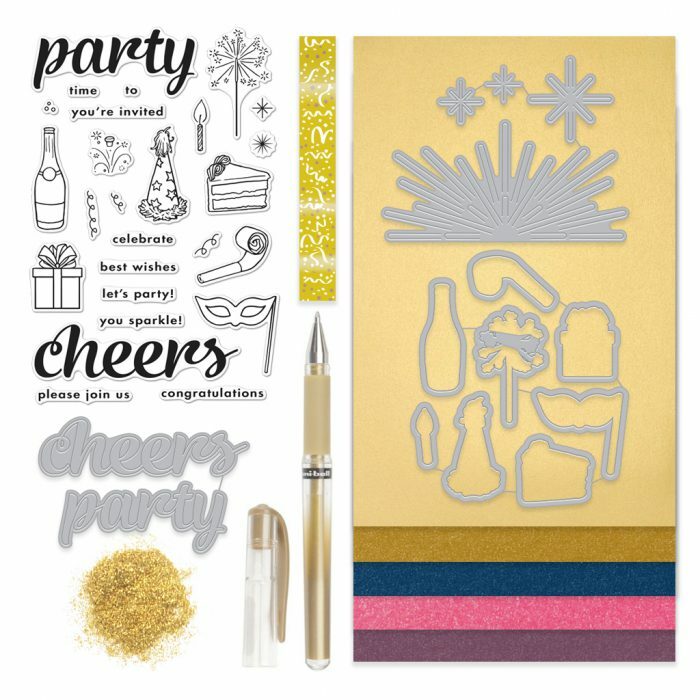 The kit contains: 4″x6″ clear stamp set; set of 8 coordinating Frame Cuts dies that match the stamp set; Two Fancy word dies – “cheers” and “party”; A set of Paper Layering dies for adding a sunburst or sparkler effect; Fun new gold glitter embossing powder; Custom washi tape designed for the kit; A gold Uni-ball Gel Pen; 4 half sheets of gold foil cardstock; 2 half sheets of each metallic cardstock: purple, pink, dark blue and antique gold. The kit value is $65, and Hero Arts is selling this one for $34.99. Fabulous cards! I love the foiling! The gold confetti look is so festive. Beautiful invitations. These cards are so beautiful, Yana. Love how you made confetti with other stamps and showed me how to use the foil. Those cards are amazing. invited. Looks like a rocking time. I love the little glass with the glossy accents and the gold straw! That is so creative! Wow, how elegant! They are really beautiful designs. Thank you for sharing! 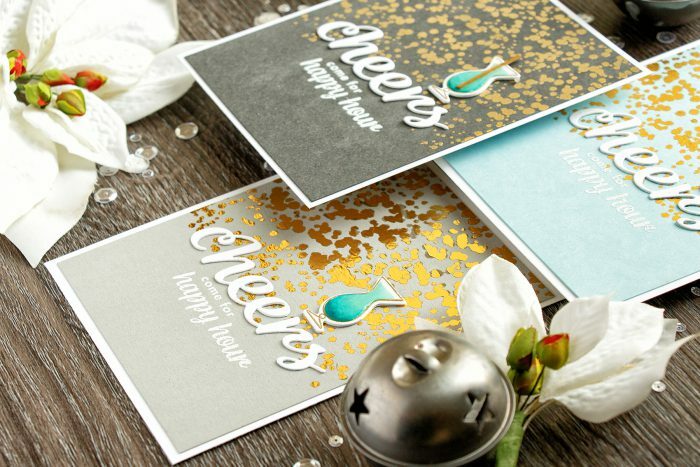 Very fun and festive invitations. What awesome invitations! looks like it is going to be a fun party. Great cards. Love the color combo’s you used. This kit is amazing! So unique! I love all the shine! Cute and festive! I just love your cards. Just beautiful. what is fun card I love the gold and the images in this kit. I just ordered my kit! Love, love, love this! Gorgeous card! The golden backgrounds are so elegant! Beautiful invitations! Love the gold foiling! The background you created is so festive! Thanks for the tips regarding foiling. My favorite element has got to be what you did with the drink glass. The detail and the Glossy Accents bring it out well. Looks awesome! Love Love Love the background! These are just amazing! 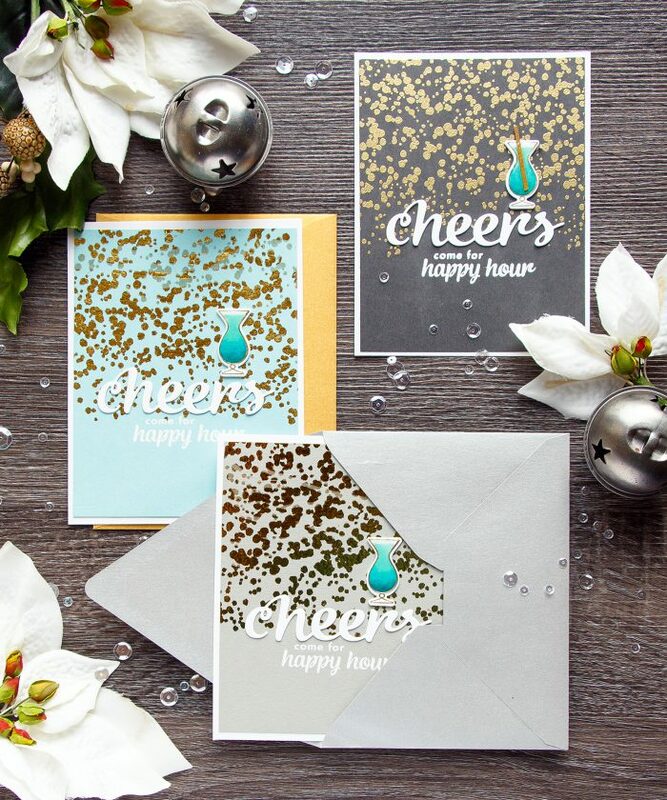 Who wouldn’t want to rush to a party with these invites?! Really great invitations! I love your bubbly background! ohhhhh great cards! I like very much the background effect! These are so festive and fun! What a great release!! Your cards are so classy. Love the touch of gold! 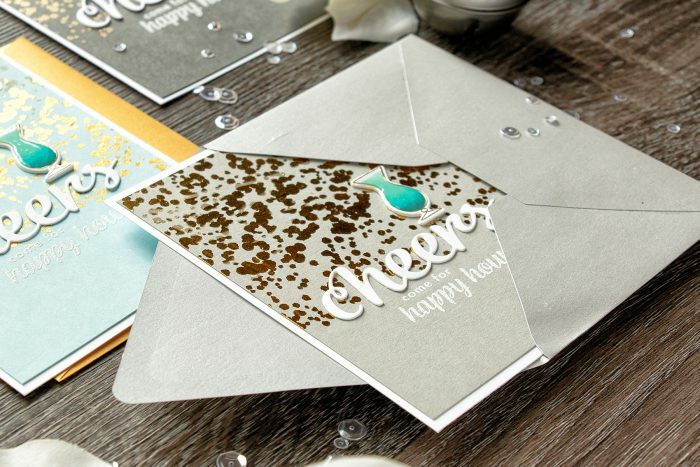 I love the foiling you added to this party invitation. Awesome color combos! The drinks look yummy! Maybe a Blue Hawaii? Great kit! I love your invitation and how easily it could be a greeting card! Gorgeous Invitations and adore thecolor combos you chose! Thank You for sharing along in this awesome release hop and for a chance at winning a beautiful kit! Yana, you have such a varied style in your card making. I am always watching your youtube videos! Your cards are just fabulous, love them !!!!!!!!! Beautiful invitations Yana! Love this new Hero Arts kit. Love all the gold in the background! Stunning!